Maddie Gerig prepares to teach a ceramics class for Goshen Youth Arts. 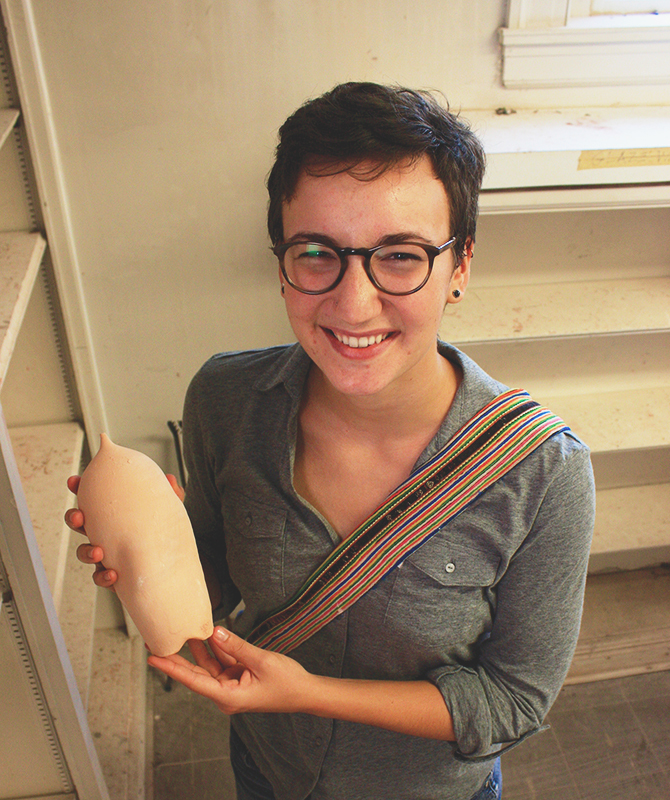 This fall, junior art major Maddie Gerig will step behind the pottery wheel not only as a student, but also as a teacher for an Intro to Ceramics course for Goshen Youth Arts. The eight-week class begins October 7 and is open for students ages 11 to 19. Although this will be Gerig’s first time teaching an art class, she gained valuable experience teaching young students one-on-one last year. “That’s what got me into [teaching]—giving one- on-one lessons and really enjoying that,” said Gerig. Goshen Youth Arts is a non- profit organization that provides after school, weekend and summer art programs for middle and high school-aged kids in the greater Goshen/Elkhart area. Founded by Zachary Tate and his wife, Leah Schroeder, GYA is committed to promoting the “growth, understanding, and importance of art in our society” by creating a welcome environment for students of any race, color or gender. GYA will be temporarily located in a printing shop at the corner of 5th and Madison until renovations are finished on its future home at 324 S. 5th Street. Meanwhile, their temporary location will host four- and eight-week classes including: Intro to Relief Printmaking, Intro to Drawing and two sections of Intro to Ceramics. Gerig’s ceramics class will focus on teaching young adults to create functional pottery— pottery that you can use in some way. In addition, Gerig hopes to teach different surface design and firing techniques. “I hope to have it be a really free and open studio space where people can run with whatever they’re doing,” said Gerig. When considering what type of teacher she wants to be this fall, Gerig immediately thinks of John Mishler, associate professor of art at Goshen College. “He is an artist first and foremost and he teaches on the side,” explained Gerig. “To me, that really shows through in the way that he works with students and just his presence in the studio.” Inspired by her professor, Gerig is excited to be an example for her students who are passionate about art and sharing it with others. Although Gerig is unsure about continuing as an art teacher in the future, she hopes, if all goes well this semester, to be teaching again at GYA next semester. To sign up for classes, find more information about GYA, or make a monetary donation, please visit www.goshenyoutharts.com. If you are interested in donating your time or skills, email goshenyoutharts@gmail.com.